Chapter headings and selected papers: Volume I. Plenary Paper I. Dynamics and Control of Reacting Systems. Modelling and control of a tubular reactor: a PCA-based approach (S. Shah et al.). Model Predictive Control. Process Monitoring. Process monitoring using model-based PCA (A. Wachs, D.R. Lewin). Understanding Complex Dynamics. Complex Separation Systems. Control of Nonlinear or Large Scale Processes. Optimization Methods. Dynamics and Control of Polymerization Methods. Supervisory control of high pressure LDPE reactors (P. Pladis, C. Kiparissides). Plenary Paper II. Parameter Estimation and Model Identification. Industrial Scale Problems and Solutions. Advanced control for PVC production (P. Barva et al.). Modelling and Simulation for Process Control. Model Based Control. Novel Approach to Identification. Process Monitoring. Volume 2. Dynamics and Control of Separation Systems. Dynamics and Control of Industrial Systems. Poster Papers. Nonlinear analysis using XPP (A. Flores, A. Silva). Plenary Paper III. Batch process engineering revisited: adding new spice to old recipes (S. Macchietto). Monitoring and Control of Processes. Issues in Controller Design and Estimation. Dynamics and Control of Batch Systems. Stability issues in fedbatch fermentation (J. Mari, J.P. Axelsson). Testing and Verifying Control Strategies. A multiobjective framework for the integrated process design and control (I.K. Kookos, A.I. Lygeros). Complex Reaction Systems. Design and Control. Fuzzy adaptive control of a plug flow tubular reactor (C. I. Siettos et al.). Control of Distributed Systems. Modelling, Monitoring and Control of Batch Reactors. PLS based monitoring and control of batch digesters (P. Kesavan et al.). Author index. 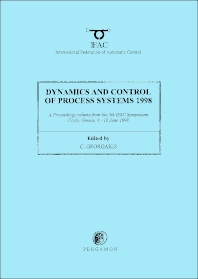 The two volumes contain the Proceedings of the 5th IFAC DYCOPS Symposium that took place in Corfu, Greece between June 8-10, 1998. The Symposium was a continuation of the very successful series that used to be called DYCORD+, the last of which (DYCORD+ '95) took place in Denmark in 1995. It was sponsored by the IFAC Technical Committee on Chemical Process Control. The Symposium embraced the topic of Integration of Design and Control that had previously occurred as a separate IFAC workshop. The theme of "Technology Push vs. Technology Pull in the 21st Century" aimed to bring together researchers and developers of new methodologies (Technology Push) as well as users of these methodologies (Technology Pull). The major areas of interest were organized in the following categories: i) Reacting Process Systems, ii) Separation Process Systems, iii) Batch Process Systems, iv) Complex and Industrial Process Systems, and v) Interaction of Design and Control.